Last week we were able to set an evening aside for a family outing. A friend of ours sent us a thank you note for letting Troy travel down to lend him a hand on some projects the previous weekend. In his note he included a gift and told us it was for us to go out as a family. I'm sure we could have saved it for something like the stock car races or the fair, maybe even the fee at a campground, something that we don't usually do. But since we had just been apart for the past weekend, and we were going to have company for the coming weekend, we thought it would be a good opportunity to use it now. So we packed up and headed to town and went out to eat at our favorite authentic Mexican restaurant, La Mexicana! We had chips and salsa, guacamole, quesadilla's, lime soda's, sope's, burrito's and taquito's until we were stuffed! Mmmm, it was so good. If you are ever passing through Antigo at lunch or dinner time, this is the place to go. After dinner, even though we could barely move, we thought it would be fun to go bowling. There weren't a ton of options for a family on a Wednesday night, but bowling is something we don't do very often and the kids enjoy. 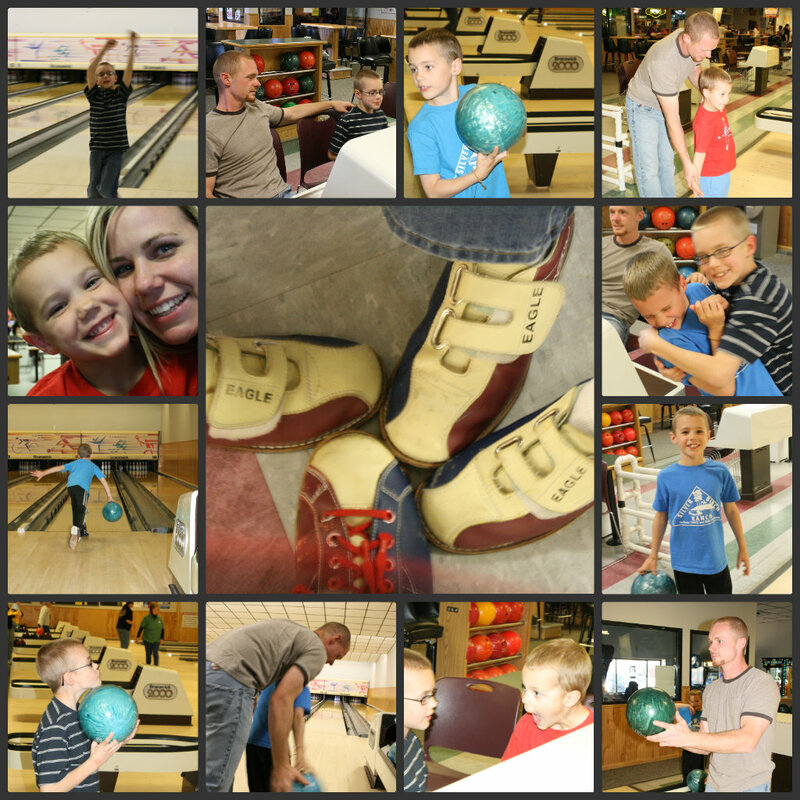 So here is our blurry bowling collage! Taking pictures that turn out in a bowling alley is hard! Especially when your kids won't be still long enough for you to focus and take a picture. But oh well, you get the idea. We had a fun time, after we gave up trying to teach the boys how to bowl properly. They just weren't getting it. Troy ended up with the winning score. Of course. Although for a few rounds, Wyat was surprisingly holding the lead. And yes, we did use bumpers. Otherwise the kids wouldn't have a score. And neither would I. That's right, I'm a closet bumper lover. I only bowl with small children so I can have a chance at a higher score. After bowling, our stomach's had settled enough to realize, we needed ice cream. Although we are usually Culver's fans, we chose Dairy Queen this time. They really do have the best hot fudge. After that, it was time for the long ride home, and into bed the kids went. All that eating and bowling is tiring. When was the last time you went bowling? It's a fun and inexpensive outing for a family. Maybe you'll have an opportunity to try out your local bowling alley this week! They'll appreciate the business, and you'll have fun! I Think It's Finally Here!